The first half of Dotty's story is here, but the second half is missing! Can your child come up with her own ending to complete the page? This exercise is a great way to give her writing practice and give her creativity a boost. 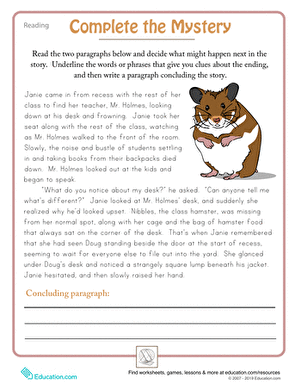 Your fourth grader can practice story sequencing and flex his reading comprehension by putting the paragraphs in order to tell a story beginning to end.